Sean Dyche felt there were signs of his Burnley side looking more like themselves against Liverpool. 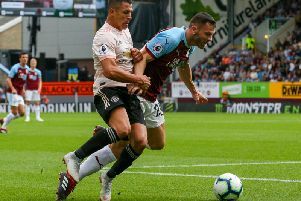 The Clarets lost 3-1 to the unbeaten Reds, having taken the lead through Jack Cork, but the reaction of the supporters at the final whistle said a lot, as they showed their appreciation at a gutsy performance. It was a sixth defeat in seven games, but Burnley made themselves hard to beat, and gave Jurgen Klopp's men a real scare. Dyche, asked whether the supporters' ovation said everything, said: "It tells me the crowd are fantastic and they want to stay with us, and they are going to stay with us and make the effort for the players. "I think that is a reaction to the performance, I think it was a very good performance. "It was a performance much more like us, we've been coming in and out of that this season, and I said to the players that has to be a constant. "They are a good side, we know that, and we still have to eradicate soft goals, but, particularly the first half, we took the game on and had great chances, and didn't quite capitalise. "But overall, a way better feel to the performance, but fantastic from the fans as well, that's an important factor going forward." Burnley have struggled to put together a 45-minute performance, never mind 90, but made Liverpool sweat, Ben Mee forcing a stunning save from Allisson late on, as Liverpool broke to make it 3-1 - despite the ball having gone out of play for what should have been a Burnley corner: "We kept going right to the death, another sign of the strong jaw and mentality, particularly against a side with their quality. "The one at the death is an ugly goal just because we think it's gone out of play and our players are busy reacting to that - we didn't get a lot I don't think, on the maybes, from the referee, but that aside, it was a good, solid performance. "We were a bit unlucky with the first goal, he (Joe Hart)'s off-side, and we don't get a block, but they're a good side and we put in a good performance. "The main thing for me was the idea of getting back to what we're about, there were signs of that and a lot of good individual performances." Dyche said he hoped his side had "bottomed out" after a poor display at Crystal Palace on Saturday, and added: "We had to respond, Saturday was not good enough, the players know that, there's a great honesty to them, and pride in what we do, and that was intact tonight. "And there were some good pockets as well, some good, effective moments, and it is difficult against these sides."